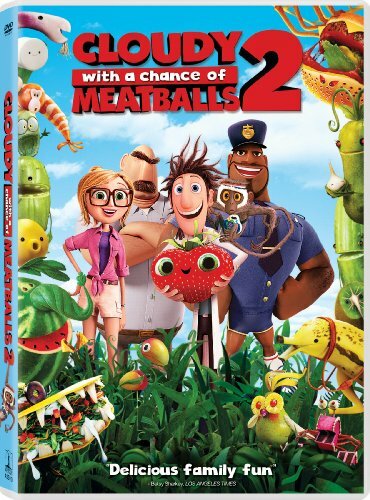 In the wake of the disastrous food storm at the end of the first movie, Flint Lockwood and friends are forced to leave their town of Swallow Falls. But when it is discovered that sentient food beasts have overrun the island, they are asked to return to save the world again. * "Attack of the 50-Foot Gummi Bear" - Flint's mischievous gummi bear grows to 50-feet by using his new food-modifying invention while Steve is in charge. Steve must frantically chase the gummi bear and transform him back to normal size before Flint returns to the lab. * "Steve's First Bath" - Flint's failed date with Sam is because of Steve's mischievous ways. * "Super Manny" - Manny, the Jack of all trades, saves an adorable kitty with his many skills. * "Earl Scouts" - The Foodimals join Earl's scouting program but are very competitive. * "Anatomy of a Foodimal" - Flamangos, Cheesespiders, Hippotatomuses! Oh my! Sit down with filmmakers to discuss the inspiration behind these wacky food-animal hybrids that have taken over Swallow Falls, and chat with the gang to find out how they came up with the Food-imal's creative and amusing names. * "Production Design: Back in the Kitchen" - Where do you go after it rains cheeseburgers all over Swallow Falls? Back to the kitchen of course! Hear from filmmakers Cody Cameron and Kris Pearn on how they came up with stories and jokes for the film. * "Awesome End Credits" - Dive into the end credit sequence with the filmmakers and discover how they used a mix of 3D, 2D, stop motion and live action. * "Cloudy Cafe: Who's On the Menu?" - Hear from newcomers Will Forte and Kristen Schaal about what drew them (pun intended) to this animated feature and how they "discovered" the voices of Chester V and Barb. Then, sit down with Terry Crews, as he steps into the pair of size 12 shoes left by Mr. T to portray Officer Earl Devereaux. Plus, hear from all your returning favorites including Anna Ferris and Bill Hader. * "Building the Foodimals" - Animators discuss creating and animating the foodimals. * "The Sasquash "- Exploring all the places in the film that the sneaky Sasquash is hiding.